During my freshman year of college I took an incredibly interesting music history class that covered everything from Gregorian Chant to the modern garbage we hear on the radio. And yes, that's how it was presented to us. We discussed early experimental music/sound from people like Luigi Russolo and Kurt Schwitters, Dadaism, tonality, and early tape manipulations. 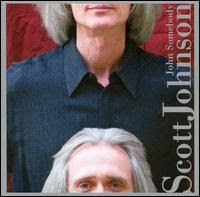 We listened to a track from 1982 called "John Somebody" which utilized tape looping and splicing. A few bands from the 60s/70s dabbled with splicing, such as White Noise, Silver Apples, United States of America, and The Beatles, but not quite to this extent. "John Somebody" forms a rhythm by looping a sample of a woman saying "the-he was a-he's a sort of a" and is accompanied by some pretty unusual guitar work. I've been looking for this since 2003, but never knew the composer's name until I noticed this release from John Zorn's Tzadik label yesterday. Experimentation and looping like this in the pre-digital age will never cease to amaze me. This is more of an interesting album than an enjoyable one, but if music is more than just recreational for you, this is an essential listen. Just based on the opening track alone, this reminds me infinitely of Charles Spearin's Happiness Project. Thanks for the tip, I look forward to hearing it. Based on the description, it sounds structurally and philisophically similar to Alvin Lucier's "I Am Sitting in a Room", in which he records a short speech, then records himself playing it back into the room ad infinitum, allowing the acoustics of the room overtake the original recording. It's nothing short of revelatory, and if you like this record I highly recommend that one (and could provide it if you need help tracking it down). Anyway, thanks as always for the good work y'all do!